Click here to check out the video that goes along with this article. HEY, MIKEY, SHE LIKES IT! My first ex-wife hated it whenever I bought any musical equipment because that meant she wouldn't be able to spend the money on herself. Never mind that I was going to be a famous recording artist some day and share all the loot with her. (Ha! I guess I showed her!) One time I bought a compressor/limiter (C/L), recorded my vocal through it, and played her the result. When she said it was the best piece of equipment I ever bought, I knew I was onto something. Honestly, that's how much difference it made to my recordings—and how much it can make to yours. Back then, I had to buy a C/L as a separate piece of hardware. These days any music workstation or computer program worth its salt has a C/L plug-in built right in, so you don't have to make a stress-filled decision about spending the money like I did. All you have to do is figure out how to use it. That's what I'm going to show you now, and it's really not that hard. A compressor simply controls your volume automatically. Limiting is compression usually set to a fast attack time with a higher ratio (something like 20:1 or even 100:1) and the threshold (the point where it kicks in) is usually higher. Now that I've started tossing around the terminology, I oughtta show you the controls and tell you what they do. Most of the devices come with a batch of presets to suit common needs. Figure 1 shows the list of the Dyn3 presets that come with Digidesign's Pro Tools. The human voice has a wide dynamic range, from a whisper to a shout. Because of that variation, it can be difficult to get a vocal to sit nicely in the mix where you can hear all the lyrics. A compressor can take care of most of that for you. Generally you want to set it up so you don't notice it's there. But there are plenty of engineers who like to use it as a special effect where it actually is noticeable. For example, the only way you can get that in-your-face effect used for the vocals in a lot of head-banger music is with a compressor. Think AC/DC. The graph in Figure 2 really helps to see how the controls affect the signal. The line begins moving upward at 90º from left to right in a one to one relationship. For every decibel the input signal increases, only one decibel is output. That's what we hear in real life. After the point of the threshold or knee (indicated by the vertical red line), the signal is attenuated or reduced by the ratio you select. In the case of the Vocal Levelor preset with a 3:1 setting, for every 3 decibels the input signal gets louder past the threshold, the output gets louder by 1 decibel. Another advantage is that if the singer can maintain the same distance from the mic, a C/L can help keep the same intimacy during the entire performance, because the EQ doesn't change due to the proximity effect. A compressor can be of great help in quite the opposite situation when you have a singer who just can't perform unless s/he's leaping all over the place. You can level out the performance, even though the proximity EQ will change. By using a low threshold (-30 dB), the device begins working at very low volumes. Let's continue with our 3 to 1 ratio. Maybe your quietest syllable is 20 db and the loudest is 100 db. The compressor will turn that into something like 5 to 35 db. Boost the output gain until the peaks appear back at 100 db (0 on the meter). Now the quietest parts, which used to sit at 20 db, will sit near 75 db—quite a difference from before inserting the compressor! To give you some idea of how compression affects the audio, take a look at the waveforms in Figure 3. On the downside, the result of a low threshold setting is that it also makes any other background noises more audible. You need to be especially cautious about such sounds as heating-air conditioning, computer fans, and buzzing amplifiers. Now let's looks at the other controls. The attack is measured in milliseconds and determines how quickly the unit responds after the signal crosses the threshold setting. Raising it will let some transients through, making the material sounds more natural and a little less squashed. 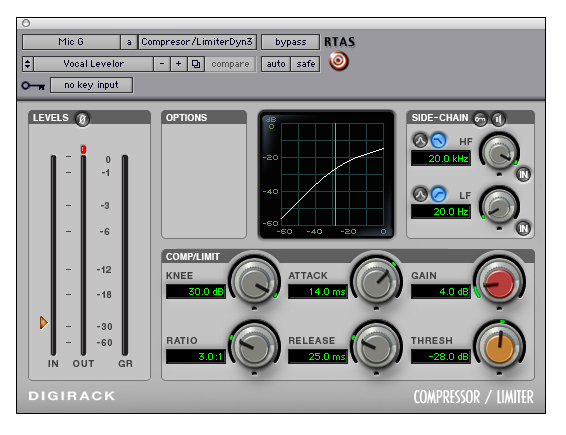 The release setting determines how quickly the compressor returns the ratio to 1:1 after the signal drops below the threshold. Again, by giving it a little time, it keeps the material sounding more natural. The side-chain section (also known as "detector") in the upper right in Figure 2 allows some other signal to control the volume. For example, a side-chain can be used for automatic gain control or "ducking" of background music when a narrator or DJ is talking. Send a bus out from the announcer's voice track to the side-chain in on the music track. It can also be used musically to make a sustained instrument pulse when another instrument (like a bass drum) is played. You can use the high and low frequency side-chain settings to zero in on pesky frequencies that can get in the way from one instrument to another in a music track rather than backing down the entire spectrum for the whole song. EASY DOES IT — OR DOES IT? While you can certainly over-compress, I think it's also possible to under-compress. I have a CD of Diana Krall titled "Only Trust Your Heart" (GRP Records). It was recorded live to two-track with no compression. When I listen in my car, I have to keep my hand on the volume knob because her voice keeps dropping below the road noise. The same is true of classical music. I've also found that having a compressor in my stage rack is invaluable when performing live in order to increase intelligibility. The unfortunate side effect is that it also increases the possibility of feedback. To control that, I use a pink noise generator and a special microphone to tune my EQ unit to the room along with a feedback exterminator to catch anything left over. Let's not forget that instruments can benefit from a C/L. Most guitar players have some version of a compressor among their stompboxes, and a little compression can really fatten up a bass guitar, providing sustain. Except for special effects like those we've already discussed, you should be cautious that you don't squeeze the life out of the performance. Use as little as you can get away with and still give the performance all the attention it deserves. You can start with the presets and tweak as you learn. Just don’t get carried away with your new toy and create something you'll be embarrassed by a year from now. Do it right and your spouse might just say it's the best piece of equipment you ever bought.